Sensei Eddie Gearhart began his studies in Danzan Ryu in 1989 at the age of nine, under the instruction of Sensei Mike Tangney. When he was fifteen years old, he took a break from martial arts to focus on his musical talents with the Santa Clara Vanguard Drum and Bugle Corps. At the end of that summer, he stumbled upon the art of Shaolin Kenpo. For the next three and a half years, he studied this art at the United Studios of Self Defense, and worked his way into an assistant instructor position within the first year. In 1996, although he enjoyed Kenpo karate, Sensei Gearhart missed the arts of judo and jujitsu. 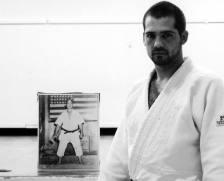 It was at this time that he returned to the Zentai Judo and Jujitsu School in Los Altos to train with Mike Tangney, Paul Jacobson, and Bruce Raney (before Raney moved to Oahu, Hawaii). While still training in Kenpo karate, he discovered his true passion was in martial arts, and desired to learn more forms. In 1997 he enrolled in a Tai Chi Ye-Chuan class, and realized the form he really loved was the Praying Mantis style Gung Fu. In 1998, Sensei Gearhart was influenced by a long-time martial arts partner to study the art of Hombu style aikido. He immediately found the connection between aikido and jujitsu, and has continued to study both these forms during the past ten years. By 2000, Sensei Gearhart had been developing himself in the arts of judo, jujitsu, Shaolin kenpo, tai chi, and aikido. In 2001, his aikido instructor, Sifu Jay Cooper, awarded Sensei Gearhart with Shodan in the art of Hosinsul. It was also around this time that Senseis Paul Jacobson and Mike Tangney suggested that Sensei Gearhart study Restoration Therapy, also known as Seifukujitsu. He enrolled in classes taught by Professor Tony Janovich and his assistant Clive Guth, and within a year he had completed both the basic and advanced courses, and earned his certification in the art. In 2003, Sensei Gearhart accepted the responsibility of training students of the Los Altos Zentai Judo and Jujitsu School, where classes meet several times a week. The Zentai Judo & Jujitsu School has been training South Bay students in the arts of judo and Danzan Ryu Jujitsu for more than twenty years. The dojo is located at the Grant Park Center in Los Altos, California, where Sensei Eddie Gearhart teaches students in two different weekly classes. Adult student classes meet Mondays and Thursdays from 7:30 pm to 9:00 pm, and class for younger students meets the same days from 6:00 pm to 7:00 pm. The effectiveness of Sensei Gearhart’s hands-on, straightforward, and skillful instruction is apparent each time the students gather at the dojo. When class meets and we assemble on the mats, it’s as if a group of friends is getting together to practice something we all enjoy doing. Everyone receives individual pointers and guidance from Sensei Gearhart, who makes sure that our skills develop with each class meeting. The pace of our instruction is even and consistent, ensuring that we each have the time we need to become familiar with concepts and techniques. While close attention is paid to each student’s progress, the atmosphere in the dojo is one of learning rather than one of pressure to perform. The learning environment of the school is also such that we don’t hesitate to help each other on the mat. We are encouraged to assist each other with perfecting our awareness, balance, movement and control of each technique we learn and practice. Like Sensei Gearhart, some students in the dojo have training in other martial arts systems, making class that much more interesting. Their experience often finds its way into class meetings, allowing all of us to gain some insight into different styles of martial arts. Another way we gain experience in other styles is through our membership in the Kilohana Martial Arts Association. Kilohana is a non-profit organization founded to perpetuate the teachings of Professor Kufferath (Sensei Okazaki's successor), as well as to promote the study of other martial disciplines so as to provide the widest possible exposure to all aspects of martial arts for its members. As members of Kilohana, Zentai Dojo students have the opportunity to attend several martial arts tournaments, seminars, and workshops throughout the year, allowing us all to gain not only an appreciation for the variety of different styles of martial arts but also to gain experience and practice in them. The Zentai Judo Jujitsu Dojo operates through the Recreation Department of the City of Los Altos, California. The Recreation Department follows a quarter system, and Zentai Judo Jujitsu Dojo classes are in session every quarter. To register for classes, and for exact meeting dates, please see the Los Altos Recreation Department website.